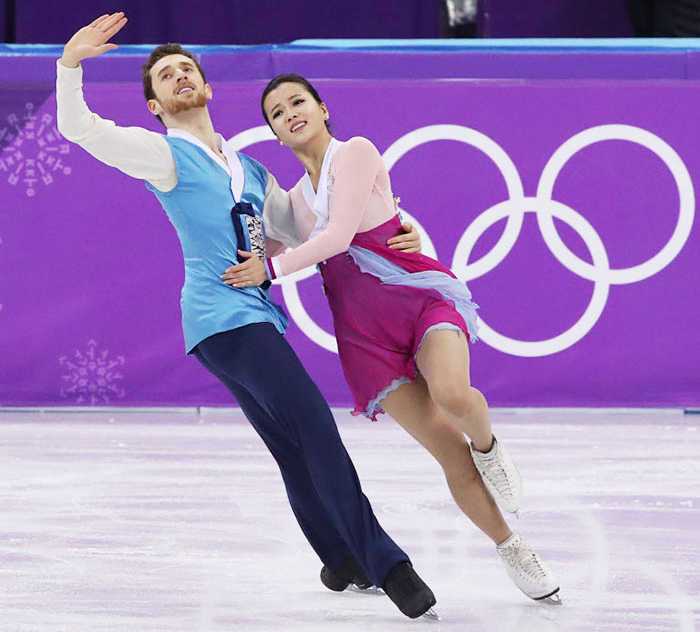 When Korean ice skaters Min Yu-ra and Alexander Gamelin removed their training jackets before their ice dancing competition at the Winter Olympics in Pyeongchang on Tuesday, the crowd gasped in delight. The two wore outfits designed after hanbok, or traditional Korean dress, as they performed to the Korean folk song "Arirang." The pair's choice was not without risk as the song is unfamiliar and judges may not appreciate it well enough to understand the couple's performance. The song, which is listed on UNESCO's intangible cultural heritage list, is the signature folk song that expresses all Korean people's feelings from joy and anger to sorrow and happiness. But Korean-American Min insisted. She wanted to use her moment in the spotlight to share Korean culture with the world. Ice dancers Min Yu-ra and Alexander Gamelin perform their free dance in Gangneung, Gangwon Province on Tuesday. Gamelin is American but became a naturalized Korean last year to compete at the Olympics. Min and Gamelin formed a partnership in 2015 and qualified for the Olympics together in September last year. But they might not have had a chance to show it to the world if they had failed in the short dance. The pair were not highly expected to advance to the free dance where the top 20 in the short program compete. They ranked 16th with 61.22 points, just a little short of their personal best. In the combined score, they earned 147.74 points, ranking 18th, but the score did not matter. They just impressed and moved the crowd, who gave a thundering applause. "I got emotional toward the end because I felt that the crowd was performing with us," Min said. "This is not over yet. We have four more years to go until Beijing. We want to do a program with another Korean song then." Meanwhile, ladies' singles figure skating begins on Wednesday. Evgenia Medvedeva and Alina Zagitova from the Olympic Athletes of Russia are red hot favorites in this event. Out of 30 skaters in the short program, Medvedeva will skate 25th, and Zagitova 28th. Korean skater Kim Ha-nul will go fifth, and Choi Da-bin 24th. Only the top 24 will advance to the free skate on Friday.